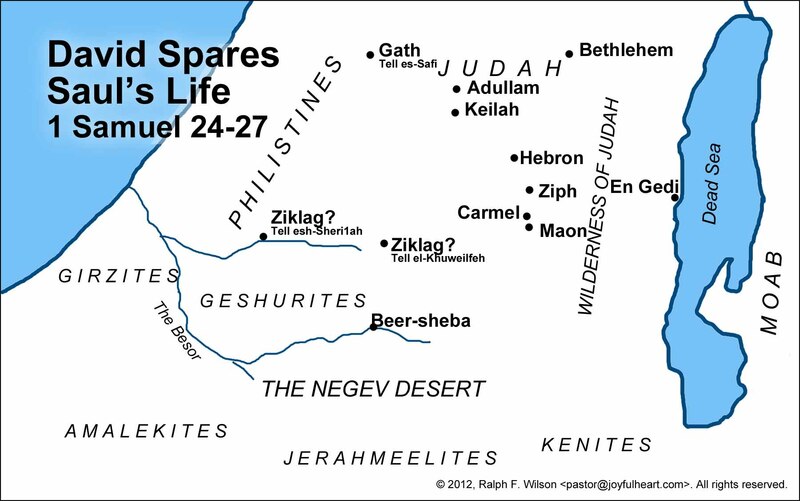 Samuel died, and David moved to the Desert of Maon. There, a wealthy man named Nabal and his wife, Abigail, lived. His men were shearing sheep when David asked him to give him whatever he could. Nabal refused, so David prepared to fight. 3) Part Personal Question. My answer: Nabal is “surly and mean in his dealings.” He is also greedy, ungenerous, and skeptical. I’m the same. I don’t believe people most of the time nor do I give out random things to people I don’t know. I bet Nabal got a lot of people begging from him, so he didn’t care who David was, the answer was no. 4) David immediately gets angry after a simple no. It seems David has gotten used to getting what he wants because of who he is since he identifies himself. He and his men put on their swords, seemingly with the intention to kill Nabal’s men and/or his livestock. 5) Personal Question. My answer: Those around me. Anger affects those closest to us. I need to be better when I don’t get my way. It all depends on what it is and how bad I want something. Still, we can’t have everything we want as David shows us here. We need to react calmly, not overreact, and move on with our lives. David does act impulsively, believing he is owed something by a man he had no agreement with. Maybe he and his men are starving. Still, that’s no reason to go and fight. It also seems like Samuel died unceremoniously. I’m sure he was remembered, but the writer here doesn’t care to go into it. What are the 4 kinds of riches? Nabal only was wealthy in what he had. This was the “harvest time” for a sheep rancher, which was a time of lavish hospitality towards others. The name Nabal means fool. In ancient Israel, names were often connected with a person’s character. He was of the house of Caleb, which means dog. This was no compliment. FUN FACT: Only Rachel (Genesis 29:17) and Esther (Esther 2:7) are described with the same Hebrew word as the one here that describes Abigail as beautiful. Why was Abigail with Nabal? David believed because he protected Nabal’s sheep of his own accord that Nabal owed him compensation. How often do we do this? Nabal looked at all of his material blessings as his instead of as God’s. What do we learn by David’s overreaction? This is striking since we just saw in the previous chapter how David responds to Saul. David was able to be kind to Saul, but it seems to have been harder to do it towards someone he perceived as his equal or lower than himself. Often, this is true measure of our character – not how we treat our superiors, but how we treat our equals or those “beneath” us in some way or another. Questions are all online at mybsf.org for the entire year.